Pumpkin Pie is rated 4.3 out of 5 by 3. Rated 5 out of 5 by Towm from Son loved it! I sent to my son and he said it was a little meszed up from shipping, but it was awesome. Rated 4 out of 5 by WandaJ from Good Taste! I ordered this pie to be delivered to my uncle for his birthday. He is in a veteran's home in Pennsylvania. The pie was delicious according to him albeit a little "beat up" during the delivery. Rated 4 out of 5 by Angel7 from Pie looks good My greeting card was not enclosed so my Grandson called me. Why not?? Our expert bakers have perfected this classic dessert! 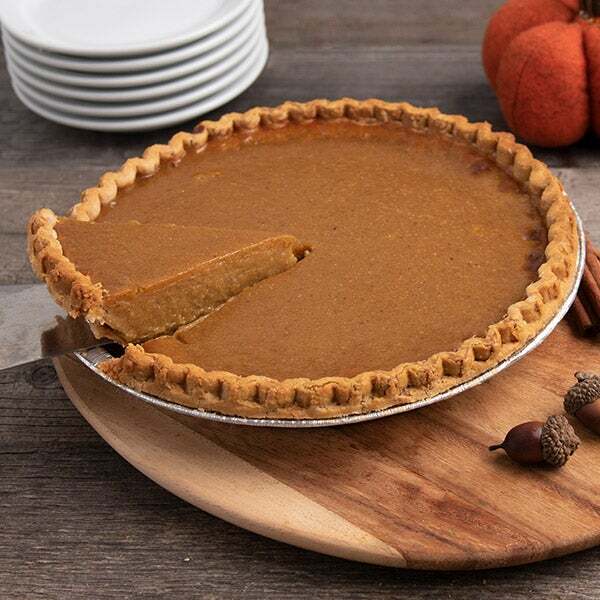 Our pumpkin pie is created in keeping with tradition, balancing sweet and spicy tastes with a combination of ground cinnamon, freshly grated nutmeg, and brown sugar, making it irresistible no matter the season!